This is my second installment of a series attempting to illustrate all of the function axes. The initial remarks and disclaimers I made in Part 1 of this series are still in effect. As I have argued in my article, Determining Function Axes Part 3, Fe/Ti ontology cares less about the empirical properties of objects and more about the ideational commonalities that unite them. This latter disposition is somewhat like Plato’s Theory of Forms where objects in the sensible world are but shadows of ideal ideational objects that exist as pure thought. With Fe/Ti types, the empirical world, with its uncontrollable, sprawling mess of facts and things and particularities, is – without any effort on the subject’s part – condensed into ideal objects and cleaner principles in the mind. Both my Ti and Fe diagrams aim to illustrate how a subject operating under this mode of cognition sees other individuals as expressions of the ideal category of ‘human being’ and therefore as extensions of themselves. 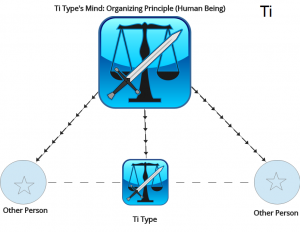 mind illustrate how all empirical manifestations of a category – in this case human beings – are regarded as belonging to the same order due to the Ti type’s tendency to group these instances in his mind by virtue of impartial principles and models. The dotted lines between the Ti type and other human beings represent how each concrete manifestation of man is grouped together by invisible ties to a principle in the mind and not on the emergent level or in the external world. The famed impartiality or impersonal nature of Ti types is here expressed by the complete non-discrimination concerning whether the particular instance of a man happens to be the Ti type themselves or another human being. 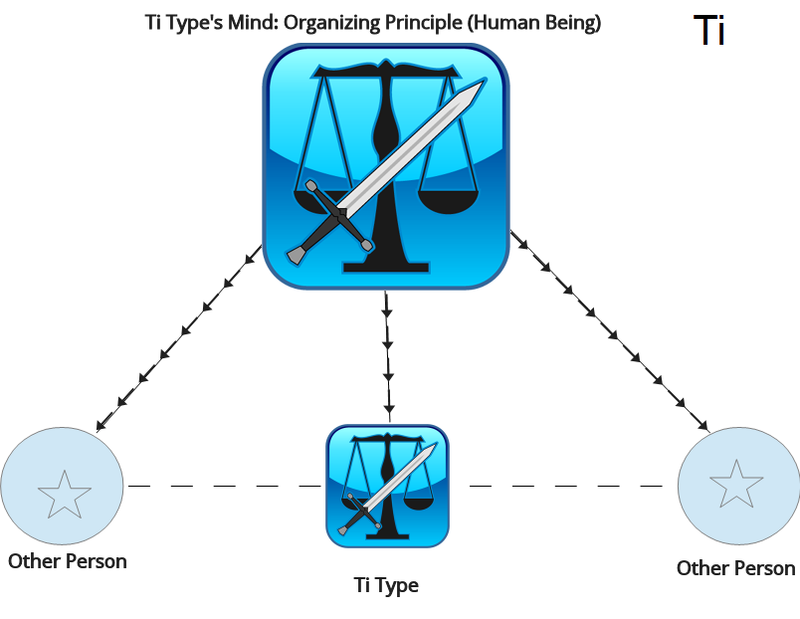 Turning now to my Fe diagram, we can see that Fe is the opposite of Ti (just as in Part 1, we saw how Fi is the opposite of Te): While the Ti type views himself and everyone else as extensions of the same impartial principle, the Fe type views others as extensions of himself (and vice versa) in a more personalized manner. The Fe type’s efforts to build rapport with others on the basis of the shared sentiments and common goals they can identify between themselves and others form a totality which leaves an imprint on the psyche of the Fe type: Here, a multitude of sentiments, values, and reactions are added up to form an inclusive outlook, encompassing both self and others. With Ti types, we saw how the impartial principle determined the status of particular individuals. 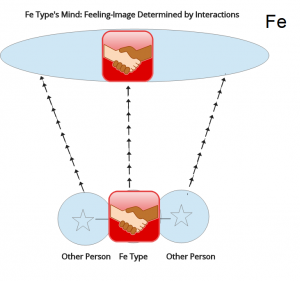 With Fe, things are really the other way around: It is the sociality and reactions of particular individuals that determine the overall feeling-image in the Fe type’s mind. (This feeling-image could equally well be called a ‘principle,’ if not for the fact that it would be very confusing for people who are not well-versed in Jungian typology. That is to say, it can be called a principle on the phenomenological level). However, there are still some differences to be noted here: Since the Ti type starts with the impartial principle, their representation of the commonalities between individuals will be impersonal, come what may. For this reason, they may seem robot-like and their rather inflexible approach may be too far removed from the actual sentiments of people. The Fe type tends to have the opposite problem: Starting with people as their cognitive nexus, and seeing people as the carriers of principles and values, the Fe type may at times be too beholden to the feedback and opinions of the people they encounter. Hence, in my Fe diagram the subject is in much closer proximity to others than in my Ti diagram. The Ti type could not move closer to other people even if he wanted to, since the impersonal principle has determined a fixed distance between all. While Fe types have more means available to modulate the difference between themselves and others (such as withdrawing from social life and immersing themselves in impartial book knowledge for long periods of time), most Fe types will still feel an inclination to incorporate everyone’s differing perspectives into their own internal feeling-image, even if they disagree with what was voiced. My diagram therefore represents Fe types as being closer to others, since that is their foundational psychic tendency, even if reflective Fe types may draw away from it at times. 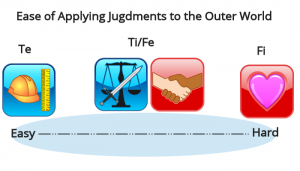 Because the Fe/Ti axis operates on the basis of commonalities, Fe/Ti types are typically less direct or decisive than Te types in arriving at and applying judgments to their environment. But on the other hand, they are often less inclined than Fi types to withdraw their judgments from the outer world altogether. 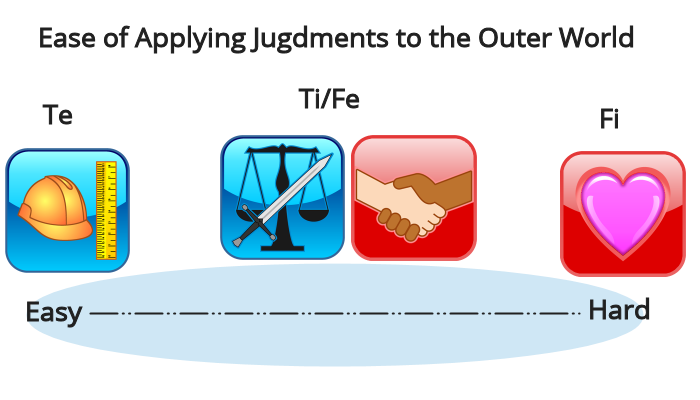 Fe/Ti types are more likely to maintain that the same set of judgments must apply to all members of a given ideational category and could thus be said to strike a middle ground between the typical exterior judging attitude seen in Te and Fi types. In this respect we may say that the polarization between the ends of the Te/Fi axis is actually much stronger than the polarization between Fe and Ti. Ti having more ease of appying judgments to the outer world than Fe? I’m not sure… Even if Fe types are not sure if what they believe is right, in my experience, they have much easy not only applying but also enforcing their judgments in the outer world. Honestly, if it was true, Ti should have more influence on the outside world than Fe has(am I right?) what is almost certainly not the case. I think an easier way to understand the two judgement axes is to look at the context of dating. For the Fi/Te type, they’re more at ease with weeding out people who aren’t like them. So let’s say if the Fi/Te type is looking for a fwb relationship. The Fi side is like “this is what I want and I’m looking for a person who values the same things I do and he/she has to have these and these things” The Te side will come out via the actual weeding out process based on the given facts about the person they’re seeing. The Fe/Ti person on the other hand is not as comfortable with weeding out people cause of certain differences. Let’s say the Fe/Ti is looking for a fwb relationship also. Ti says “people and sexuality are so complicated, its safe to say humans have both sexual and romantic sides to them and one of these sides will come out if I present myself a certain way”. Fe will come out via presenting a person’s POV into the overall feeling atmosphere of the dating situation and talking it out until both people reach a mutual understanding of things. This is just a working analogy and although its not perfect, I just wanted to get the idea out there. EDIT: The Fi/Te type will weed out certain people if they’re not compatible with the Fi desires of the individual. I think I finally have put my finger on what has always sort of bugged me about your portrayal of the two axes on this site (and it’s more than just Boye Akinwande). I get the impression that Te-Fi, as portrayed here, is more ominous or less “human” somehow, than the Fe-Ti axis. I dunno, maybe it’s because they tend to be portrayed via their extraverting functions (Fe vs Te), or because most writers here operate off the Fe-Ti axis, but that subtle bias is there to me, but it’s so subtle I haven’t been able to put it into words until today. Strange, House, I have the exact opposite reaction. You could literally take your second paragraph and switch Ti/Fe with Fi/Te and that would be my impression. Although that’s my general impression even outside this site. Even so, I do agree with you on the bias point. It’s there, especially for Fe. #David. You make it as Fe=nice. You really haven’t met FJs who jump at conclusion about others without knowing where the person is coming from? Because irl it’s quite common, specially with SFJs. Fe can be inclusive but also exclusive, based on the share social understanding where some personality characteristics are agreeable and others not. There are people who are nicer and less nice in every type, so this equalization of Fe with only the most agreeable personality traits is off. Sure, they are the best at making you feel included but they can easily see others as outside them. As someone with auxiliary Fe, I think Fe/Fi is the hardest of them all to distinguish. It’s hard to separate truth and value, at least in my world. P.S. The second sentence is a separate thought from the first. I didn’t write that to mean Fe is truth and Fi is value. Oops. Carry on.